Oh, hello! Long time no see. Sorry for being quiet for a bit longer stretch there. Sometimes when you develop a game a lot of the back-end stuff gets done, which means there isn't much visible to show. We have been working on many things, I have probably forgot some of them. I want to start by showing a really cool screenshot of an asteroid base. We want the universe to be filled with other groups and their ships, but also space stations built to support space exploration. We thought it would be cool if humans decided to build these stations at/on asteroids! Making for cool asteroid bases that you can visit. We've been working on finalizing the user interface, testing that it looks OK on different screen sizes and resolutions. There is still some unpolished work, like polishing the button graphics and what not. However, the bulk of it is done! 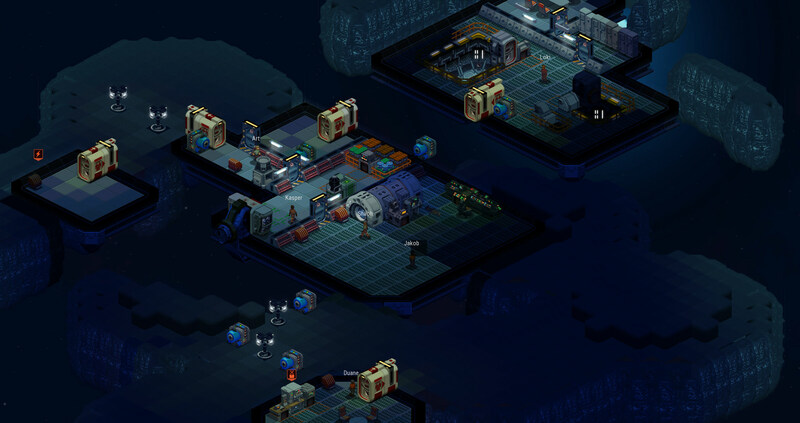 Above is a screenshot of the ship storage facility. 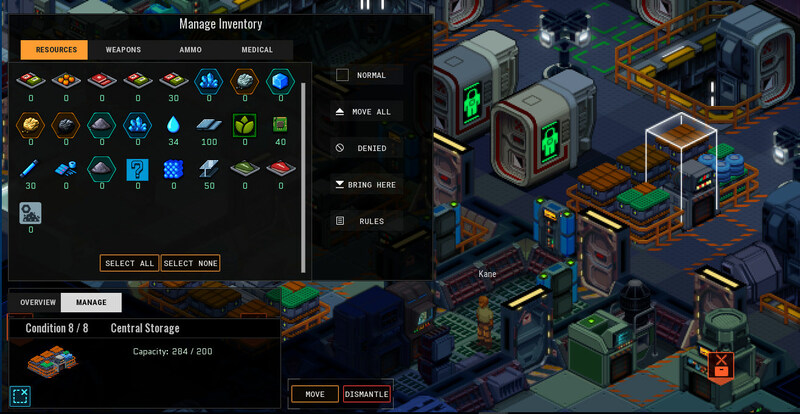 You can build these wherever you like and optimize how you want them to store resources. 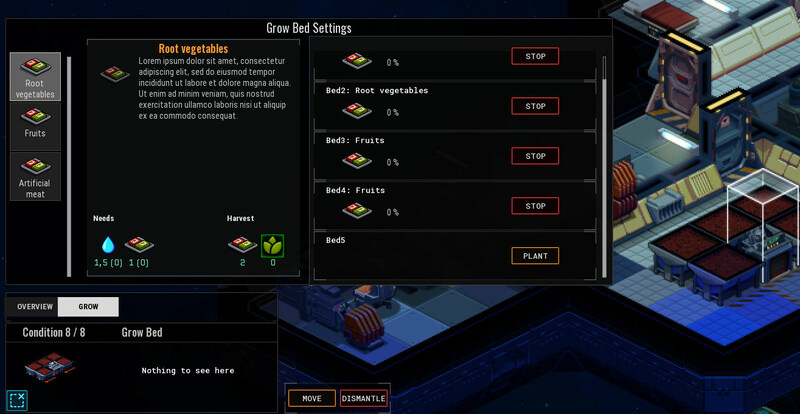 Above is a screenshot of a grow bed, allowing you to plant fruits, vegetables and more to help sustain your crew aboard the ship. Growing plants will require water and the right environment conditions. It will also require someone who knows what they're doing, otherwise there is a risk that the crop will die! After finishing with the user interface (for now), we jumped into adding some character to our characters! No longer are they mere robots carrying out orders. We have made them much more human, which of course makes things a lot more interesting. We created a fully fledged mood system, which I have to admit is very similar to RimWorld. We like to try to be unique whenever we can, but we really didn't see a better way to do this. 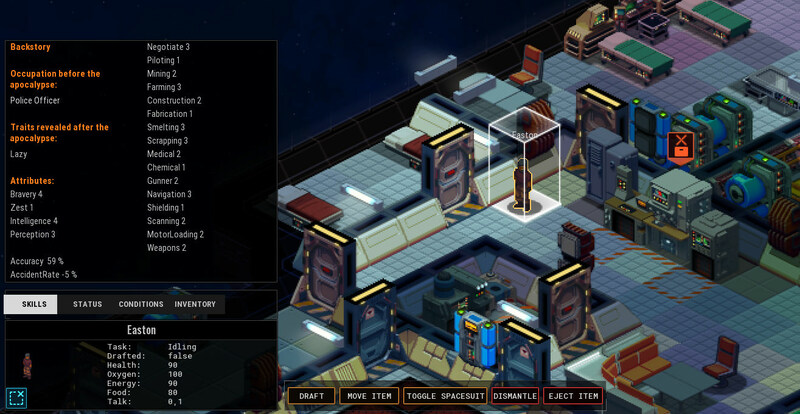 It is, however, tailored to Space Haven and has some features that separate it from RimWorld. Much of it is based on Maslow's hierarchy of needs. This mood system is what steers a lot of the game play and gives the player incentive to evolve and expand, to make the base better. 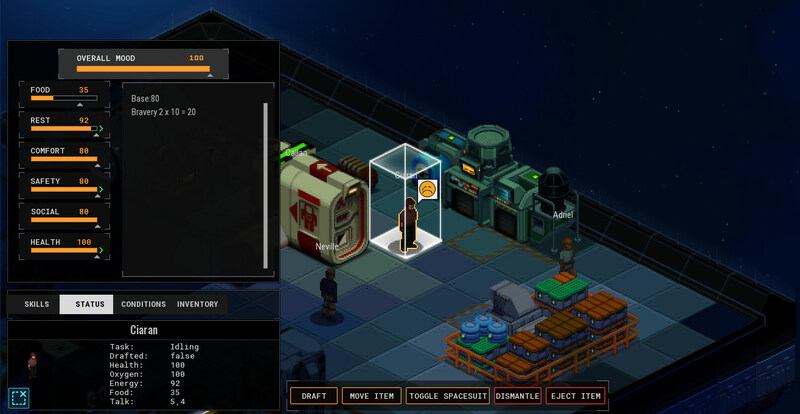 Above is a screenshot of the skills and backstory of a character. We came up with the idea to develop some interesting backstory by linking occupation and traits to before and after everything went to hell. So the backstory will show what occupation the character had before the apocalypse, and which traits were revealed when the world collapsed. This combination can create interesting backstories like a character being a police officer but then revealing traits like being a wimp or psychopath after facing the apocalypse. The characters true nature shining through in dire times! Of course the police officer shown above is a very stereotypical police officer, lazy and likes to eat donuts! And finally for some fun stuff! We have also created a speech system to the characters in the game. This will be the way characters interact and actually develop some relationships between each other! We decided to use icons and emoticons, because they will allow for a lot of imagination, while still giving enough of context to know what is going on between characters. Above is the new guy asking if he can join a couple of fellows at the dining table. A heated discussion takes place when Neal walks up to the guys expressing his concern, Coby hates Neals guts so he immediately puts him in his place. Neal gets sad and Guy finds the whole ordeal very amusing. Please keep the forums in English, we cannot mix languages here. Sorry about that! We cannot make this game faster than it can be done. There is no point in releasing a game that is not good enough, in an unfinished state. There is nothing else we can do but to do our best. Game development does not work the same way like making a pizza, where you have a recipe, slap the ingredients on it and then throw it in the oven. We are creating a game nobody has done before, there is no set recipe or set solutions to the problems we face. This makes it impossible to know exactly when the game is ready, when it is good enough. It's hard, damn hard. So please be patient and give us time to make this game something special. I think the game is looking better and better, and I'm glad you're taking the time to do it well instead of rushing out something half finished. Ignore the poster above, you're doing great work! It looks amazing! I'm sure the wait will be worth it! Thanks guys! Your comments lift our mood and help us keep pushing hard. Wow! The interaction between the sims looks great. Can't wait to play, but we must be patient! Super awesome! Looking forward to more news. Space and asteroid stations should be a great addition to the game, but I am wondering how will they (and our ships) be powered?